Making his point at a meeting with Niti Ayog vice chairman Rajiv Kumar at his residence here, he said schemes should be conceived as per the unique circumstances of states. 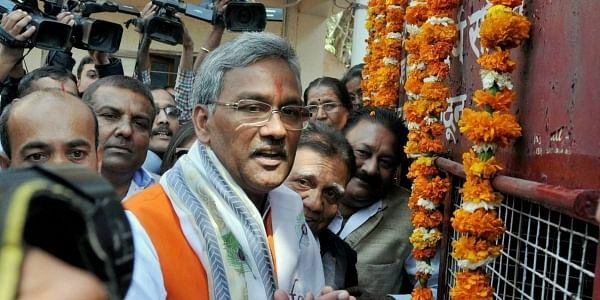 DEHRADUN: Uttarakhand Chief Minister Trivendra Singh Rawat today made a strong pitch for the Niti Ayaog structuring its schemes as per the states' circumstances and asked it to include a provision for building ropeways to boost connectivity in hill villages under the PMGSY. Rawat expressed the state government's intentions to give a boost to tourism, organic farming and horticulture basedactivities and added that building of ropeways should be brought under the scope of the Pradhan Mantri Gram Sadak Yojana (PMGSY) to strengthen connectivity in hill villages, an official release said. It would help save the hills from the damaging effects of road building, he said. Kumar said there should be a direct communication between the Aayog and the state government and his visit to the chief minister was meant to know the priorities of his government. Niti Aayog would also takes steps if the state government needed any assistance from the central government in the implementation of a scheme, he said. Secretary (Planning) Amit Negi gave a brief presentation on behalf of the state government which sought expert advisory services from the Aayog for the unification of departments, solid waste management, developing new tourist spots, creation of homestay facilities for visitors, industrial policy for the hills and construction of ropeways. The state government also demanded a green bonus for Uttarakhand.